Der Freisprechclip Gigaset L410 weiß schafft endlich Bewegungsfreiheit: Wenn Sie telefonieren, müssen Sie kein Mobilteil in der Hand halten. Der kleine Clip lässt Sie frei und ungehindert reden. Besonders praktisch: Das leichte Gerät kann überall an der Kleidung befestigt werden. 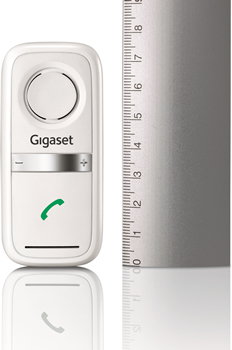 The handsfree clip Gigaset L410 weighs just 30g. The dimensions are 8 x 3.6 x 2 cm. You barely notice the little thing when you attach it to the shirt collar, jacket pocket or even to the trouser pocket. While you're on the phone, you can do a thousand other things. Whether you are surfing, cooking or working on the Internet, you can communicate with others in excellent voice quality and have both hands free at the same time. Accepting and ending a conversation is very simple: at the push of a button. Volume and ringtone can also be adjusted on the device at any time. No matter where you are, you can be reached anywhere near your landline phone as long as you are within 50 yards (indoors) or 300 yards (outdoors). The hands-free clip L410 knows a lot of technology. Thanks to the DECT-GAP standard, it is compatible with all cordless telephones. With some devices from Gigaset there is an additional compatibility: You can take over calls on the handset at any time, if you want - simply by pressing a button. The cordless phones Gigaset C610, S810 and SL400 offer this special feature. Of course you can also use the L410 for free internal calls. Incoming external or internal calls can be easily distinguished: they arrive with different ringtones. Regardless of whether you make external or internal calls: The voice quality of the L410 is always excellent. This is ensured by the proven Siemens technology, which is included in every Gigaset landline telephone. Thanks to an energy-saving switching power supply, the power consumption of the L410 white is very low. In the supplied charging cradle, the handsfree clip can be recharged in no time. The radiation power is low: The Eco Mode Plus significantly reduces the transmission power. No wonder the SAR value is below 0.1 W / kg. Gigaset also thought about the security against eavesdropping: The voice transmission is encrypted so that it is virtually impossible to listen to your conversations. If you are looking for an innovative way to be able to make free and unhindered calls at any time, then opt for the hands-free Gigaset L410 white phone. For less than 40 euros, the chic part rewards you with its comfortable hands-free calling in brilliant sound quality. Also available in black . Der Freisprechclip L410 misst 8 x 3,6 x 2 cm. Der Clip ist so konstruiert, dass er perfekt an der Kleidung anhaftet. Der Clip bleibt garantiert sitzen.